AN Arsenal Soccer Schools selection will be the team to beat as some of Ireland’s top young sides look to impress at this weekend’s DB Sports Tours Manchester Easter Cup Small-Sided Games Blitz. Our new tournament, which takes place on Saturday (March 23) and Sunday (24) in the English city, gives 7-a-side and 9-a-side teams from Ireland their first chance to compete against foreign players and teams. We began the Easter Cup as an 11-aside tournament – which West Dubliners St Francis FC won last year in the Under-12 section – and this year it is the turn of the younger stars to shine. The likes of Blackburn Rovers, Bury FC, Chester City and Preston North End will provide exciting opposition for the traveling Under-10 and Under-11 teams – but Arsenal are the obvious top draw. 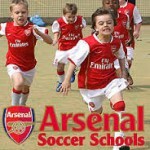 Arsenal Schools are pilot academies of the famous Premier League club located in countries throughout Europe, Africa and Asia. Every academy is based on the Arsenal way of playing – pioneered by Arsene Wenger – so the likes of Peamount United, Naas FC, St Francis, Enfield, Shelbourne and an NDSL selection will have their work cut out in the U-11 section. In the U-10 section a younger NDSL side will be joined by Peamount, Templeogue United, with Blackburn Rovers the big draw there.